Construction of the Patricia and Phillip Frost Museum of Science is 96% complete and the museum is preparing for a May 8 opening, Mayor Carlos Gimenez reported Tuesday to the Miami-Dade County Commission. Commission Chair Esteban Bovo Jr. said he still has a problem and “it doesn’t sit well with me that [entry] is still quite expensive for families. “I don’t know if we have the authority to ask [the museum] to review prices,” he asked the mayor. The mayor said members of the administration sit on the board of directors. “We can’t dictate, but we can certainly ask the board and encourage them to have special rates,” Mr. Gimenez said. As the museum nears completion, Mr. Gimenez reported, it has prepared an updated budget for its opening year. The fiscal 2017 operating budget, with net operating income of $1,168,140, covers a 7-month period from March through September rather than a full year. “This partial, first year takes into account costs of pre-opening phasing of staff and services necessary to operate, program and market the new museum,” the mayor wrote in a Feb. 27 memo. The museum’s management used the baseline information from the operating forecast report prepared by a management consultant with expertise in preparing operating and maintenance budget estimates and then made adjustments for “new” information now available as it is closer to opening. The current budget includes the costs of recently-concluded procurement of building insurance and marketing services as well as updated utilities, building systems and maintenance costs. “Once opened to the public, the museum will closely monitor actual expenses and adjust the budget as necessary,” Mr. Gimenez wrote. As for operating revenues, the museum has been selling annual memberships and will begin marketing advance ticket sales as soon as the opening date is final, he wrote. Work to restructure the museum’s board began in March 2016 to strengthen capacity for raising private sector funding toward operations expenses, he wrote. The museum launched its new website at http://www.frostscience.org/ in early October 2016. The website includes information on membership, exhibits, ongoing programs, events and museum news, among other details. Additionally, users can sign up to receive online communications, including a new monthly newsletter. On April 5, 2016, county commissioners authorized a grant agreement with the museum for $45 million, to be financed by convention development tax revenues. 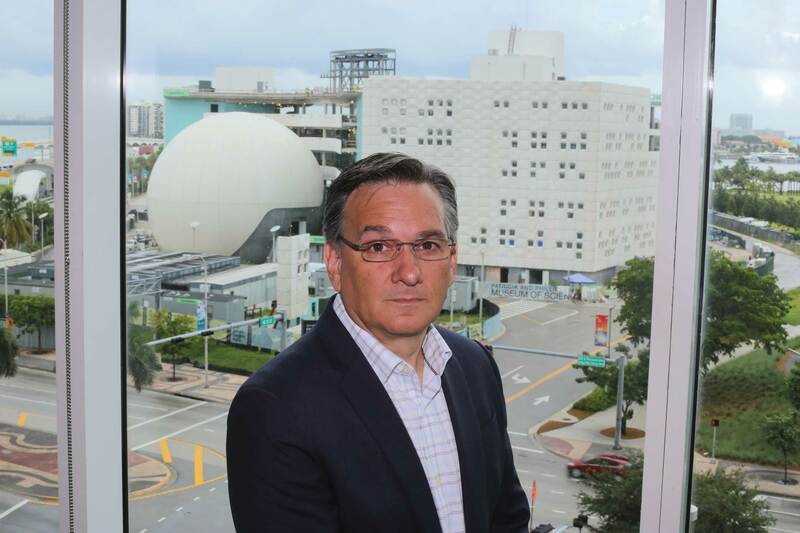 In September 2016, Miami Today profiled Frank Steslow, who was named president of the Patricia and Phillip Frost Museum of Science on July 1. At the time, he said from his temporary office that when the museum opened its new facility downtown in the first quarter of 2017, it would be just the beginning of a collaborative relationship with the community. He said his goal is to build back credibility with those with whom a partnership had been established and continue building on it. The complicated project of constructing the museum has many moving parts, Mr. Steslow said, and many parties put in a lot of time and energy, including the City of Miami and Miami-Dade County commissions, taxpayers and private contributors. Ultimately, Mr. Steslow said, this is a community asset with a lot of space that can be programmed for other uses that haven’t even been thought of yet, but it’s going to be here for the next 100 years so there’s a lot that can be developed to launch the future. Yeah, but how much is it going to cost to get in? Hard to believe they still don’t– or won’t– reveal that answer. I suspect the price of admission will generate controversy and they know it. According to a March 3, 2017 Miami Herald article, general admission to the Frost Science Museum will be $28.00 for adults and $20 for children ages 3 to 11. Hope this information helps. They have to be kidding. What family can afford that? Where’s the discount for living here and paying taxes? Heard today that there will be no reference to climate change or global warming at this science museum. Trying to figure out if what I heard was “fake news” or an appalling reality in general after the tragic event of November 8th or specific to Florida with the spectacularly awful GovernorRick Scott. Any info?